Charlie Russell’s and Maureen Enns’s efforts to reintroduce three orphaned grizzly bears to Kamchatka is one example of the growing international efforts to restore wildlife to their rightful place in the world. But sometimes restorationists want to put predators like grizzlies back into places they haven’t been seen in centuries, sparking opposition from those who say dangerous animals just can’t coexist with people in some places anymore. Controversy, for instance, surrounds a U.S. government proposal to reintroduce grizzly bears into the Selway-Bitterroot Wilderness areas of Idaho and western Montana. The preserves hold the largest contiguous area of suitable grizzly-free habitat remaining in the lower 48 states. More than half of those who opposed the reintroduction said in a recent poll that they fear that the bears will threaten hikers and nearby residents. But the National Wildlife Federation, which supports reintroduction, says bear attack statistics suggest such fears are unfounded. Since 1900, they note, the chance that a park visitor might be harmed by a bear is less than 1 in 2 million. Grizzlies are most likely to attack if they are surprised. 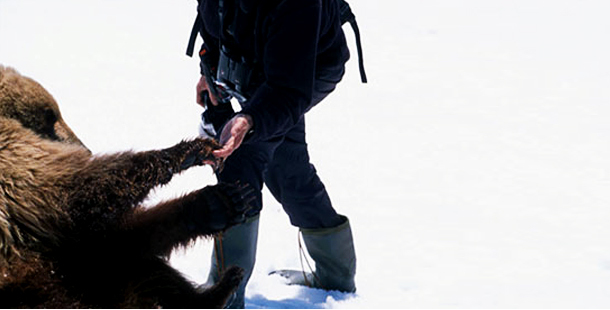 Hikers that make noise on the trail or converse normally within a group will alert a bear to their presence long before they get close enough to frighten it. Wilderness users should be alert for any sign of bear activity, such as fresh tracks, droppings, or a carcass. If you do come across such a sign, it is wise to turn back or take an alternate route so as to avoid a confrontation. Grizzly females are very protective of their young. While they may be cute, travelers should recognize grizzly cubs as a sign of danger and avoid them at all times. Most importantly, be sure to store food and garbage properly when in grizzly country. Place all foodstuffs in commercially available bear-proof containers or suspend it out of reach of bears. Campers should also cook away from their campsite and sleep in different clothes than those they cooked in, as grizzlies have an acute sense of smell. The importance of keeping grizzlies out of human food and garbage cannot be overemphasized, the National Wildlife Federation says. 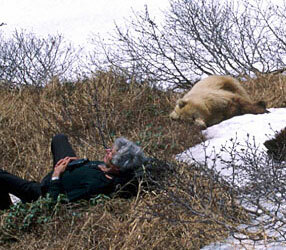 Bears that become habituated present a danger because they lose their shyness. Grizzlies that end up wandering around towns are bound to get into trouble, bringing tragedy to both people and themselves. But by using common sense, wilderness lovers can help make the outdoors a safer place for both bears and humans.